For the 2018–19 season, the Nuneaton Branch of the HA is celebrating its centenary. Founded in 1919, by 1921 there were 78 members. In 1924, members went on a ‘charabanc’ tour of Leicestershire churches, ending at Fenny Drayton, where they joined in the celebrations for the tercentenary of the birth of George Fox. For much of the last 100 years there has been a close connection with King Edward VI School, now King Edward VI College. Meetings have normally been held there, and headmasters were frequently Branch President and also gave talks. By the early 1970s the branch, though still meeting occasionally, was struggling. 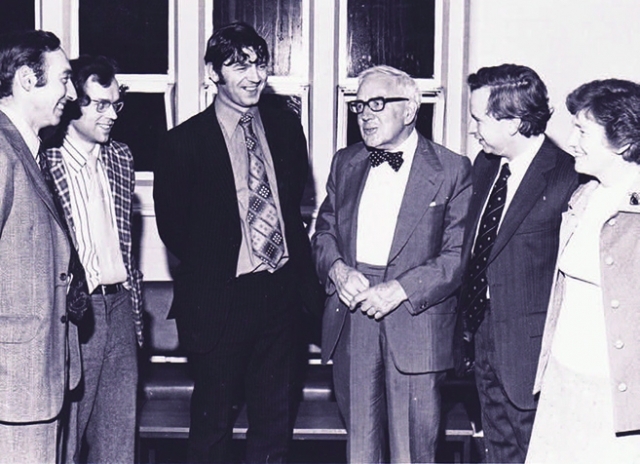 However, it was revived in 1974–75 by a new Secretary, Dr Trevor James, now Editor of The Historian and for many years our HA Honorary National Secretary. When the local grammar school became a sixth form college in 1974, Trevor exploited the large potential sixth-form audience to arrange lectures that would appeal to them as well as the general public. A consistent theme has been the eclectic nature of the programme. This for 1946–47 included ‘The Anglo-Saxon invasions’, ‘The Agrarian Revolution of the sixteenth century’ and ‘Liberty in England 300 years ago’ (the 1640s), as well as ‘The spirit of Swedish history’ and ‘Postage stamps as historical documents’. We adopt the same approach today and our ‘strap line’ is local, national and international history. Our members enjoy this variety and it makes our appeal quite distinctive from typical local history society fare. In our Centenary series of talks for 2018–19, we will be fortunate to be addressed by HA President Tony Badger, as well as ex-Presidents Anne Curry and Chris Wrigley. Topics will include ‘American presidents’ 100 days’, ‘Byzantium, Agincourt and Bosworth’, and ‘Britain 100 and 200 years ago’. One highlight was the visit of A.J.P. Taylor in 1977. He may have re-cycled his 1976 lecture marking the Bulgarian atrocities, but he held the 300-strong audience spellbound. He charged just £6 expenses, the second class rail fare to Nuneaton from Euston. Another highlight was in 1990, when the branch organised a book launch meeting for Eileen Gooder’s Squire of Arbury, which was one of the Coventry HA local history publications. 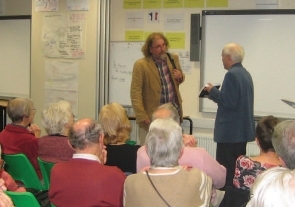 More recently, in 2015, a talk by Richard Buckley, lead archaeologist on the discovery of Richard III’s remains, drew a large audience and produced new members. In recent years the branch committee has arranged two meetings a year in an afternoon, which especially targets local King Edward VI College students and the variety of courses that they now study. This has been successful in attracting a remarkably mixed audience, with ages ranging from 16 to 88. A number of Nuneaton students who attended meetings years ago have come back to address us in their capacity asuniversity lecturers, including Carl Watkins, Rachel Ritchie and Louise Wilson. The tradition of an annual outing established back in the 1920s still continues, and now there are often two. Historical town walks have been popular and have included Ashby de la Zouch, Coventry, Lichfield, Stratford and Warwick. Chronologically, the range of visits has gone from the Roman fort at Wroxeter to 78 Derngate, Northampton. For a number of years we organised annual tours of Midlands churches (reminiscent of that trip in 1924) with expert guide Lawrence Jones. While Nuneaton is not a large branch, we have survived well financially. Treasurer Helen Allred has managed the budget with skill for nearly 40 years and our band of associate members has provided us with useful additional income, while our central position in the country ensures a variety of speakers from a variety of places without excessive travelling expenses. King Edward’s history teachers have played a major role on committee, but we have always ensured that non-teaching general-interest members play an active role. We have had three excellent long-serving Secretaries, Norman Davies, Marion Hine and Jennie Raybould, who have found us the range and quality of speakers that has been much appreciated by members. In recent years, numbers attending have grown steadily and evening meetings generally number around 40 but doubling when the students join us on Wednesday afternoons. We always host a round of the Great Debate, and our current initiative is a plan to get students to develop a Facebook page for us. At a number of AGMs we have followed the business meeting with five-minute talks by members on historical subjects. The camaraderie this has produced and the talent it has revealed have both been equally pleasing. The core of HA branch activity is where one is informed and enlightened in that most civilised of subjects, history, by those keen to impart their expertise and uninterested in grabbing high fees. This is a rare and precious commodity in today’s world. May it continue for the next 100 years!